This photo of Favreau and Clinton appeared on Facebook Friday. (CNN) — Jon Favreau, future White House director of speechwriting, has so far been at a loss for words over Facebook pictures of him at a recent party. Pictures of Favreau, 27, at a recent party appeared on Facebook Friday. 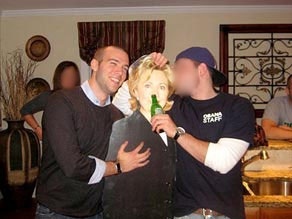 In one of the photos, Favreau, who served as President-elect Barack Obama’s chief speechwriter during the campaign season, was dancing with a life-sized cardboard cut-out of future secretary of state Hillary Clinton. In a second photo, a friend was offering the cutout a bottle of beer while Favreau stood beside the likeness with his hand on the cardboard New York senator’s chest. The picture was reportedly up for a scant two hours or so before Favreau removed it, along with every other picture of himself beyond his profile photo — but there’s no getting the Facebook genie back in the bottle. Favreau wasn’t talking to reporters about the incident, but transition officials said he had offered an apology to Clinton. The Clinton camp reaction? "Sen. Clinton is pleased to learn of Jon's obvious interest in the State Department, and is currently reviewing his application," Clinton aide Philippe Reines told the Washington Post.